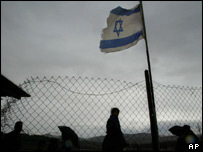 Israeli soldiers say they arrested an 11-year-old boy who had been set up as an unwitting suicide bomber. The boy was given a bag with a bomb inside, that was meant to explode as he carried it through a military post, Israeli security sources said. The sources blamed the al-Aqsa Martyrs Brigades, but that group denied any part in the alleged plot. 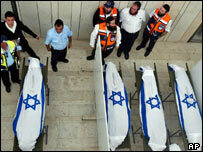 The news comes as Israeli forces around the Gaza Strip are built up in wake of a twin suicide attack at the weekend. The boy at the centre of the alleged bomb plot, Abdullah Quran, has now been released by Israeli forces and allowed to go back to school. Reports say he regularly tries to pick up extra pocket money by carrying bags and parcels for people crossing the Huwwara checkpoint near Nablus, on the West Bank. On Monday, he says, a man handed him a rucksack, asking him to give it to a woman on the other side. But soldiers at the crossing became suspicious, and say they discovered a 10kg (22lb) bomb, packed with nuts and bolts. We do not use children. We do not lack in (adult) fighters. When they found the device, they said someone tried to detonate it remotely with a mobile phone. An Israeli security source said two members of the al-Aqsa Martyrs Brigades - which are linked to Yasser Arafat - had hatched the plot. "They took advantage of the boy's innocence and used him without his knowledge," he told the Reuters news agency. "It seems they planned to activate the device using a cell phone as the boy crossed the checkpoint, in order to hit soldiers." But a senior leader of al-Aqsa said: "We do not use children." "We do not lack in (adult) fighters. The aim of the Israeli army is to belittle the Martyrs Brigades. They are lying." The Israeli security cabinet has voted to approve a number of operations against militant groups in response to the bombings. The army plan consists of targeted killings of Palestinian militants - including leaders - and ground operations in the Gaza Strip, a security official said. Meanwhile Voice of Palestine radio and other sources said a heavy build-up of Israeli forces had begun around the Gaza Strip. It is thought Israel could be about to launch operations in the Strip, following a double suicide bombing at the weekend, which killed 10 people. The attack on the port of Ashdod - considered a strategic target by the Israelis - was carried out by two young men from Gaza.